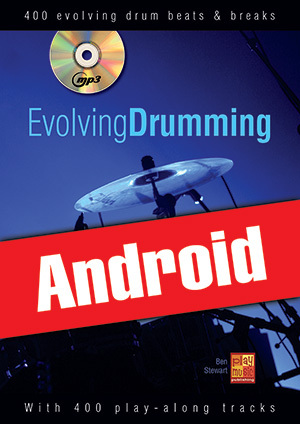 Evolving Drumming (Android) (DRUMS, Courses for Android, Ben Stewart). This method is designed for all drummers, from beginners to advanced, willing to practise their instrument cleverly, whether alone or supervised, in order to refine both their independence, coordination and, above all, musical skills. Through a simple and progressive logic, any drummer will indeed find what he or she is looking for among the 400 evolving drum beats & breaks featured in this method. The beginners will spend some time working on the first pages while the more advanced drummers will quickly go to the next pages to discover and practise rhythms matching their level. The MP3 CD features the 400 examples of the book in order. For each audio index, you will at first hear the bass/drum pair for several bars before the drums are muted to let you take the place.